George Ernest Sutton was born in Nottingham in 18812, the third of seven children of George (b. c1854, Holbrook, Derbyshire) and Sarah Ann Sutton (b. c1856, Derby, née Wetton )3. In 1891, the family was living T 8 Lomas's Yard, Nottingham with George senior working as a box cutter4. In 1895, George died at the early age of 42, leaving his widow with two infant children and three of school age5. By 1901, George Ernest, now aged 19, had started work as a threader with a lace curtain manufacturer and was living with his married sister Elizabeth's family at 22 Lomas Yard, Nottingham6. Early in 1905, George Ernest married Mary Alice Price (b. 1885), the daughter of John, a brewer, and Phoebe, his wife.7. By 1911, the couple had moved to Beeston, quite probably following Abraham Parkes' Lenton-based curtain making operation which had recently expanded to Beeston's Anglo-Scotian Mills, to fill the vacuum that followed the demise of Wilkinson's curtain lace operation 5. Their new home at 95 Marlborough Road8 was then in a newly opened up part of Beeston and was in easy walking distance of George's probably workplace. There had been sadness in the early years of the marriage, when two children had died as infants but the birth of a son, Albert Victor - called 'Sonny' by his parents - later in 1911 brought happier times9. Having now re-established a stable family life, it is perhaps understandable that he was not amongst those who enlisted so enthusiastically when war came in August 1914. But by 1916, the number of men volunteering for service was diminishing and was not meeting the relentless demand from the Western Front and the Government was looking for ways to fill the gap. The Derby Scheme, which introduced canvassing for volunteers had still not persuaded the required numbers and the Military Service Act was now enacted which meant that, from March 1916, all single men aged between 18 and 41 (with some exceptions) would be automatically conscripted. As a married man, for the moment, he continued to be exempt but in May 1916 this restriction was removed and he too was required to enlist. It appears that George Ernest enlisted with the Army Cyclist Corps in August, 191610. In the early years of the war the cyclist battalions were employed in coastal defence duties and were not usually sent abroad although, as the war progressed small groups of men from what had become the Army Cyclist Corps were sent to assist by providing support behind the front line. As Private Sutton's Service Record has not survived, we have no record of whether he ever served in this role or, when he was sent to France in any role. The most likely, scenario was that he was transferred to 2nd Battalion Lancashire Fusiliers in March or April 1918. On 21st March, the German Army had launched its Spring Offensive from the Hindenburg Line with the objective of ending the war before American troops and resources could tilt the balance towards the Allies. The objective was to smash through the Allied lines, push the British forces into the sea and to cut off their supply lines by seizing the ports. During the following few weeks the enemy attacks had made worrying progress and there had been heavy casualties. By April the army was facing a desperate shortage of manpower on the Western Front and reinforcements were being found from reserve and non-combatant units as well as by lowering the age that young soldiers could be sent abroad. When the Spring Offensive was launched on 21 March 1918, 10th Battalion was in the front line at Havrincourt, south-west of Cambrai, and faced repeated attacks and were forced to retreat to the reserve line were it continued to be attacked with heavy losses, forcing further withdrawals, a pattern that was to continue in the confusion over the next several days. During March, the battalion had casualties totaling 7 officers and 223 other ranks. 62 reinforcements arrived. Much of April was spent in training and reorganisation, including the consolidation of 7 officers and 441 men from other units, although there were further substantial losses11. It had been a worrying and confusing time but thankfully, by the end of April the danger of a German breakthrough had passed. While enemy attacks continued up to July, the German forces were too depleted and exhausted to maintain the iniative, particularly now that American troops were now being deployed as independent units to reinforce the Allied positions. In August the tide began to change when Allies had achieved a major breakthrough at the Battle of Amiens and now planned to use this significant change in the momentum of the war across the wider front, a turning point of the First World War on the Western Front and the beginning of the Allies' Hundred Days Offensive. For its part, 10th battalion was at Mesnil, north of Albert, at the beginning of August where it was able to advance into abandoned enemy positions with relatively minor casualties although actions towards the end of the month brought greater losses. In early September the battalion was very active in an area east of Ytres, near to the Bapaume to Peronne Road and faced heavy shelling, including gas shells, and there were heavy casualties. It was probably during this period that Private Sutton was wounded and removed to a Casualty Clearing Station - probably the 59th - where, despite every effort, he died. He was buried in Varennes Military Cemetery, situated in the village of Varennes, 11 kilometres from Albert and 18 kilometres from Amiens. This cemetery had been laid out by the 39th Casualty Clearing Station in August 1916, during the Battle of the Somme, but the first burials were made during August and September by more mobile divisional Field Ambulances. The 4th and 11th Casualty Clearing Stations then used the cemetery from October 1916, joined by the 47th from December 1916. By May 1917 Varennes was deserted and remained so until the Germans launched their offensive in this quarter in April 1918. The cemetery was then extended by the 17th and 38th (Welsh) Divisions by the addition of plots II and III, and at the beginning of September 1918, the 3rd Canadian and 59th Casualty Clearing Stations arrived at Varennes. 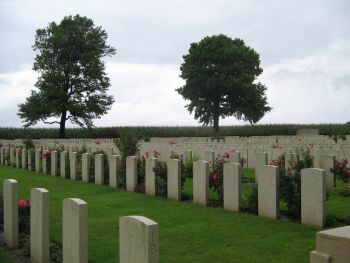 The cemetery contains 1,219 burials of the First World War12. Private Sutton was posthumously awarded the British War Medal and the Victory Medal13. His financial effects of £10 2s 5d were paid to his widow on 5 February 1919 and she received his War Gratuity of £9 on 10 December 191911. 14. On November 2nd 1919, Mary Alice suffered another terrible loss when her brother, Harold Ernest Price, who was then serving with the 61st Infantry Regiment, 5th Division, American Expeditionary Force, was killed in action on the Western Front. Their brother John Victor Price had also emigrated to the USA, in 1911, and worked at a mill in Providence City, Rhode Island, as a lace draughtsman12. After the war, Mary Alice and her son moved to live at 49 Osborne Road, Radford, Nottingham, probably to be closer to her wider family. By 1939, she was living alone in West Bridgford and died in Basford Registration District in Q4/1949, having left her modest estate to her brother, Albert James Price. George Ernest's mother, Sarah A Sutton, appears to have married again, in 1917, to John Robinson, but died in 1925, aged 6913. 2His birth was registered in Nottingham Registration District in Q1/1882 (Ref 7b 323). He was baptised at St Marys Church, Nottingham on 4 June 1882. at which time his birth date was recorded as 31 December 1881. 3The marriage was at St Marys Church, Nottingham on 7 June 1874. The record of his father's name as 'William Sutton', on the Commonwealth War Graves Commission website, appears to be incorrect. 4Nottingham, 1891 Census, Piece 3169 Folio 57. George Ernest's siblings were then Thomas (b. c1877), Elizabeth Ellen (b. 1870) and William Wetton (b. 1888). The following were born after this census : Emma Annie (b. 1891), Albert Richard (b. 1893) and Louisa Emma (b. 1894). 5George Sutton's death was registered in Nottingham Registration District in Q1/1895 (Ref 7b 275). 6Nottingham, 1901 Census, Piece 2671 Folio 151. Elizabeth had married Albert Holland on 12 October 1899 and they had two children at the time of the census. 7Their marriage was recorded in Nottingham Registration District in Q1/1906 (Ref 7b 444). 8Beeston, Notts, 1911 Census, Piece 20427 RD429 SD3 ED2 Schedule 59. 13Details from George Ernest's World War 1 Medal Roll entry and his Medal Card - available on ancestry.com..
12Harold Ernest Price, had arrived in the USA on 24 September 1914 (Manifest of Arrivals through Canadian Ports). He had settled in Pawtucket, Rhode Island and found work as a bookkeeper with Regina Lace Company in Central Falls, R.I. by the time he registered for the draft on 5 June 1917 (Draft Registration Card). His brother, John Victor, also registered for the WW1 draft. His American passport application dated 1922, includes a photograph oh him. his wife and two children. 13Family details from standard genealogical source, including the 1939 Registration and Probate Calendar. Mary Alice's Radford address is given in George Ernest's Commonwealth War Graves Commission entry.